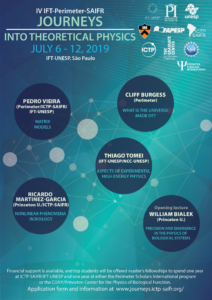 The fourth edition of the IFT-Perimeter-SAIFR Journeys into Theoretical Physics will take place on July 6-12, 2019 (Saturday-Friday) at the IFT-SAIFR in São Paulo. The school is aimed at outstanding undergraduates in their last year from all countries in Latin America. It is associated with a partnership between ICTP-SAIFR/IFT-UNESP, the Perimeter Institute for Theoretical Physics and the CUNY/Princeton Center for the Physics of Biological Function, and is also related to a joint international masters program between the institutes. Cliff Burgess (Perimeter Institute): What is the Universe made of? Copyright © 2019 IFT-Perimeter-SAIFR. Powered by WordPress. Theme: Spacious by ThemeGrill.